Toronto, Ontario – May 31, 2018 – U3O8 Corp. (TSX: UWE), (OTCQB: UWEFF) (“U3O8 Corp.” or the “Company”) reports that geophysical test work showed that electrical tomography (“ET”) proved successful as a means of delineating channels at the base of the gravel layer in its Laguna Salada Deposit (“Deposit” or “Project”) in Argentina. 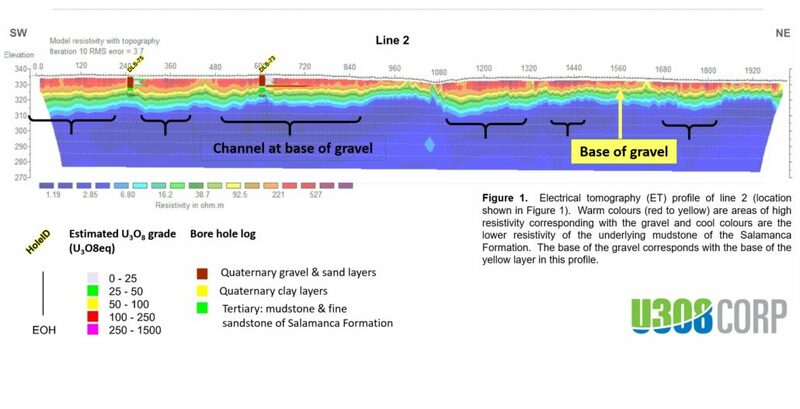 Gravel-filled channels contain generally higher uranium-vanadium grades and this test work proved that ET can be used to detect the location and depth of channels beneath younger cover. The National Instrument 43-101 resource at Laguna Salada was based principally on a one-metre thick layer of uranium-vanadium-bearing gravel that extends from surface to a maximum depth of only three metres. 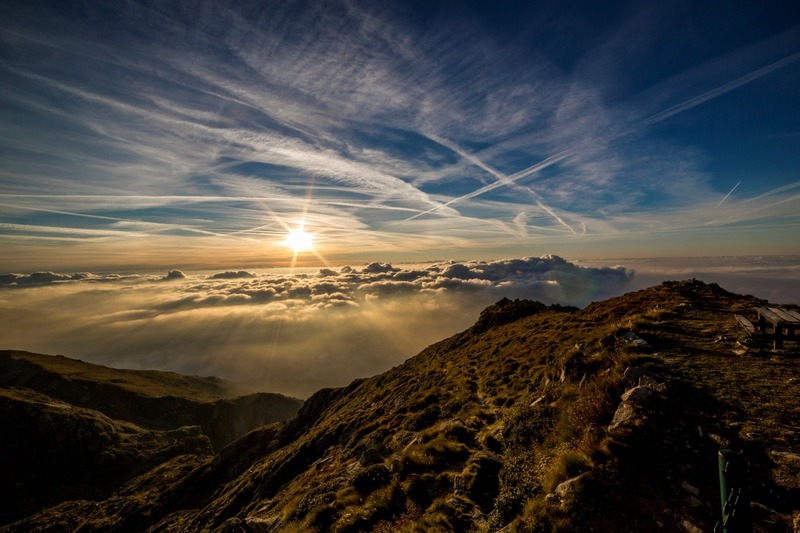 However, exploration that was undertaken after the resource estimate had been completed, revealed that the mineralization extends downward in channels below the average level of the gravel base. These extensions not only increase the contained volume of mineralization, but contain generally higher uranium-vanadium grades, that may result in the estimated cash-cost of production being even lower than for the near-surface material on which the preliminary economic assessment (“PEA”) was based (see press release dated February 7, 2017). The Company’s initial exploration was in areas where the gravel is exposed on surface and thus yields strong radiometric anomalies that were easily located in the field with a hand-held scintillometer. In adjacent areas where the mineralized gravel is covered by barren gravel, the radioactivity is masked and exploration for the deeper layer has been done through trenching, which is time consuming and expensive. Using vertical ET profiling, the Company has successfully located completely buried gravel-filled channels that correspond with relatively high grades from prior drilling. The ET profile shown in Figure 1 shows subtle depressions that define the base of the gravel-filled channels that are anywhere from 100 to 400 metres wide. These channels can be projected in the third dimension to yield a map that outlines a network of channels that have a similar geometry to present-day braided rivers. This is consistent with the origin of the gravel at Laguna Salada: it developed in a very extensive gravel plain formed from the erosion of the Andes mountains. This test work has proven that ET is highly effective as a tool to identify gravel-filled channels. Although the all-in cost of the survey was approximately US$3,500 per line kilometre ET would ideally be used to define the depth, location and orientation of channel features so that further resource expansion through trenching and/or drilling could be undertaken more efficiently and more cost-effectively. Even where channels are too deep for any contained uranium-vanadium to have potential to be commercially extracted, their location still provides valuable information that could be used to trace them into areas where they are less deeply buried – where they would constitute exploration targets. The trial was undertaken on five parallel lines spaced at approximately 200 metre intervals covering 7.6 kilometres. An array of 10 dipoles were used at a spacing of 15 metres between dipoles. The survey was conducted by an independent, Argentine-based consulting company. A PEA is preliminary in nature and includes inferred mineral resources that are considered too speculative geologically to have the economic considerations applied to them that would enable them to be categorized as mineral reserves, and there is no certainty that the results of the PEA assessment will be realized. Figure 2.a. Contour map of the elevation of the base of the gravel defined by electrical tomography adjacent to the resource area at Laguna Salada. Lower elevations are in black and blue contour lines while higher-elevation areas are delineated in red and yellow contours. Pale green overlay shows the location of principal channels. Coloured rectangles are U3O8 values in trenches excavated in the Company’s prior exploration at Laguna Salada. b. Present-day braided stream in a gravel plain similar to that in which the Laguna Salada region developed. •	Berlin Deposit, Colombia – a PEA shows that Berlin also has low-cost uranium production potential due to revenue that would be generated from by-products of phosphate, vanadium, nickel, rare earths (yttrium and neodymium) and other metals that occur within the deposit. Information on U3O8 Corp., its resources and technical reports are available at www.u3o8corp.com and on SEDAR at www.sedar.com. Follow U3O8 Corp. on Facebook: http://www.facebook.com/u3o8corp, Twitter: http://www.twitter.com/u3o8corp and YouTube: http://www.youtube.com/u3o8corp. 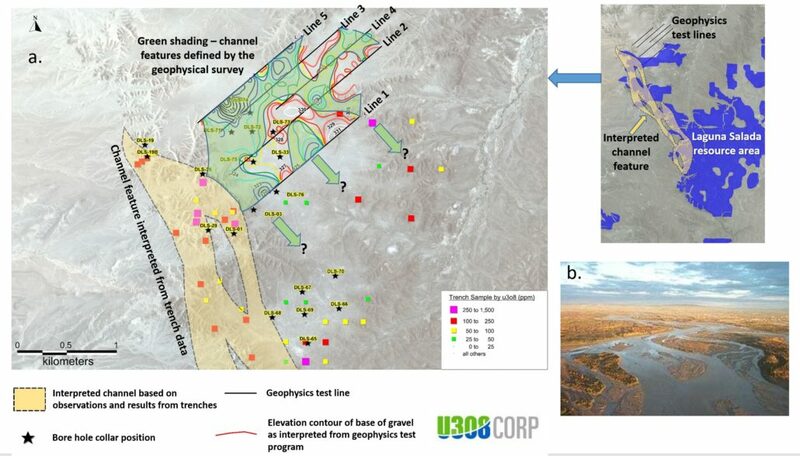 Further details on U3O8 Corp.’s Laguna Salada Deposit and Argentina’s electricity generation from large nuclear reactors, as well as its prototype small modular reactor that represents a prime export opportunity, are available in the Company’s Corporate Presentation accessible on the homepage of our website http://www.u3o8corp.com.